Voice computing is opening new possibilities for the retail industry, especially to inspire and interact with customers. So, this holiday season (2018), H&M decided to take the lead when it comes to shaping the voice commerce of the future and to have their customers be part of the journey. H&M in USA launched the H&M HOME Gift Guide – an easy to use voice application filled with inspiration and ideas for different holiday gifts for anyone’s home available via the Google Assistant on all smartphones and Google Home smart devices. 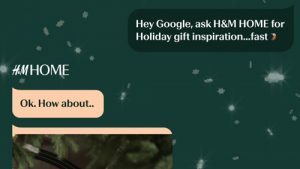 To activate the H&M HOME Gift Guide, users had to simply ask for H&M HOME from their Google Assistant and then easily browse through the H&M assortment to find the most suitable gift. The voice application also offered easy payment through voice. H&M HOME initially announced the creation of a voice application, called H&M HOME Stylist, in June 2018. At that time, H&M said the voice stylist offered personal styling suggestions, mood boards and inspiration for every room in the home. Hence the H&M Home Gift Guide is just a revamped version of H&M Stylist, prepped with Holiday themed products. bpost is Belgium’s biggest postal service. To prove their ability to deliver and to fend of new contenders in the market of delivery services, they decided to open a pop-up store bang in the center of Brussels. People had to act really fast to catch the items before someone else did. Once sold, the item was immediately picked up by a postman, right in front of the webcam, and delivered to the winning bidder. This way everyone could see for themselves how fast and reliable bpost was. As a result the awareness of the specific service – bpack – rocketed to 65%. In 6 days 260,000 unique visitors were registered and for every hour the shop was online, bpost sold 8 products on an average. Mobile and creative thinking can come together to create really compelling marketing campaigns. 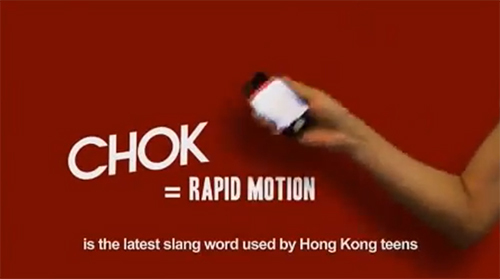 In this example, Coca-Cola Hong Kong created a ‘Chock Chok’ mobile app that turned viewers smartphones into a remote control for their TV Ad. To collect the Coca-Cola bottle caps that appeared on the TV screen, viewers had to swing their phones when the ad came on. Those who successfully managed to swing and collect were instantly rewarded with prizes that included cars, sports apparel, credit card spend value, travel coupons and movie tickets. However as far as I know, Honda in UK was the first to pioneer this kind of an interactive TV ad, even though it did not receive results like Coca-Cola. Posted on March 14, 2013 March 14, 2013 Categories Emerging Technology, Emerging Trends, Marketing Strategies, Mobile, Power of Online, Social MediaTags accelerometer, audio signal, bottle cap collection, Chock Chok App, Chock Chok mobile app, coca cola, Coca-Cola Hong Kong, compelling marketing campaigns, creative thinking, Hong Kong, instant rewards, interactive tv ad, Mobile, remote control apps, Smartphones1 Comment on Coca-Cola Chok! Chok! Connected devices such as smartphones and tablets have contributed to an explosion in digital media consumption. As these devices gain adoption, print newspapers around the world are seen suffering from declining readership and revenue. To combat this the Tokyo Shimbun along with Dentsu Tokyo came up with a new way to connect with readers. An Augmented Reality Reader app was created that brought to life the newspaper by overlaying educational versions of the articles for kids. 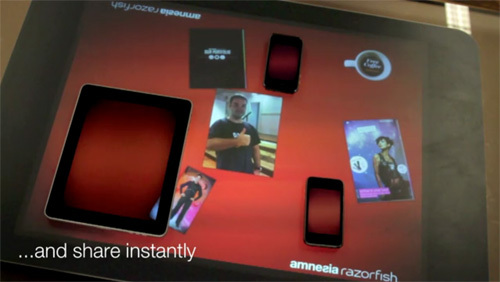 Amnesia Razorfish is back in the news with the launch of Amnesia Connect – a software which allows instant and seamless sharing and transfer of any content such as photos, music or embedded apps between multiple handheld devices using a Microsoft Surface table using a single gesture. The Amnesia Connect software currently works with all Apple iOS devices and is being further developed to work seamlessly with Android, Windows Phone and BlackBerry Smartphones. In a world where smartphones are becoming omnipresent, this kind of software opens another world of ideas for brands!